San Diego County is home to some fine disc golf courses, with more being added regularly. The courses listed below are available for public use all year long and each have their own pluses, minuses and personalities. The courses are listed based on their order of installation. Along with a brief description, there are web links displayed for each of the courses. Along with a link to the courses’s own web page, we have included links to pages on three disc golf directory-like sites: The PDGA Course Directory is the official list of disc golf courses world-wide, constantly updated since it was first published in 1985. Dgcoursereview.com is a fantastic source of statistics and information about disc golf courses, and is the best source for reviews of courses written by the players themselves. Discgolfscene.com uses its course directory as a way for players to track their scores, aces, results and rivalries and provides players a place to display “what’s in the bag” and write on each other’s wall. Happy hunting! Morley Field, San Diego, CA – San Diego’s original disc golf course and probably the most-played course in the world, and for good reason. Located in San Diego’s historic Balboa Park, Morley Field is a fantastic example of what a pay-to-play course can provide: well-maintained grounds, multiple pin positions on each of the 19 holes (changed weekly), regularly scheduled competitive events, and a well-stocked pro shop run by a multiple-times world champion, Snapper Pierson. While the layout is not particularly long, it requires technical precision and good putting to score well. You will use most of your bag during a round at Morley, and a variety of shots as well. A must-play. Sun Valley Golf Course, La Mesa, CA #CLOSED AS OFF 2017 – Sharing space with a 9-hole executive length ball golf course, Sun Valley’s 9 Discatchers provide players with a lot of long, booming tee shots. The first hole, in particular, has you carry your disc over a big valley, to a basket protected by cacti and yucca on the side of a hill. Mostly open drives to baskets tucked next to and behind ball golf greens and bunkers. $5 per round to play, paid at a pro shop with a friendly staff and great sandwiches. They sell a few discs, too. Keep your eyes open for the Sun Valley Open, a fantastic PDGA B-tier tournament run each year in the summer. 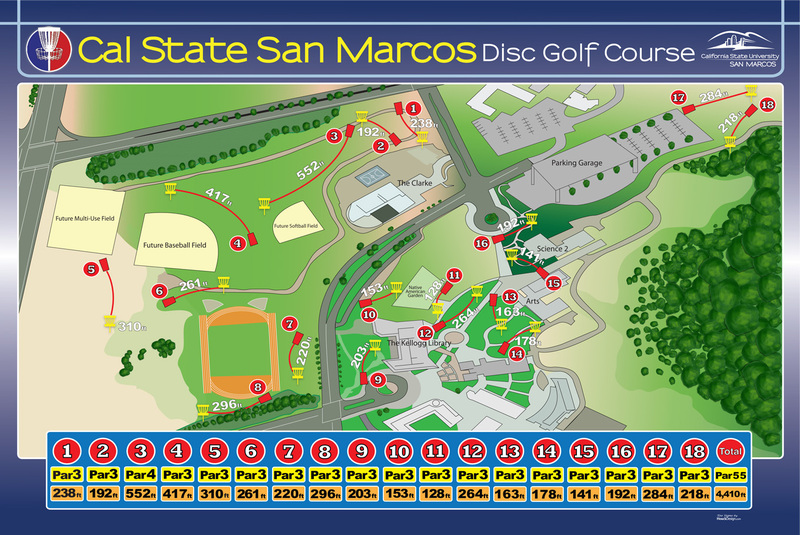 Montiel Park DGC, San Marcos, CA – Montiel Park was installed in 2008 by the City of San Marcos, providing San Diego County with its first free-to-play disc golf course in over 20 years. The course received a major facelift in 2014, adding irrigation, over 40 trees, ground cover patches and improved walking paths. Montiel’s 9 holes weave back and forth uphill for the first 5 holes, give you a breather with the flat hole #6, and then finish with three downhill holes. The standard layout has concrete teepads, while nine alternate (and longer) tees are a combination of rubber mats and tee shots from the adjoining street. The holes are mostly open, making use of the few trees as strategically as possible. Managing elevation change is important at Montiel, as is managing the fast, skip-happy “greens” in the summer. The Aces run a weekly doubles league on Monday evenings during the Spring and Summer, switching to Saturday mornings when the days become shorter. Sunset Park, San Marcos, CA – This short 6-hole course is set in a very busy, very kid-friendly park. The course was designed for kids or new players – it’s very short and pretty wide open. It may be the site of a PDGA SuperClass tournament in the near future, and also sets up well for kid’s clinics. We ask that you use only blunt-edged discs on this course – putters or Ultimate discs. Cal State University San Marcos DGC, San Marcos, CA – CSUSM is home to the first permanent basket course on a Southern California college campus. The course was funded completely by private donors, led by the San Diego Aces and Innova Disc Golf and is open for play by students, staff and local disc golfers. The 18-hole design starts on the campus’ lower athletic fields, then winds through the middle of campus, passing the Kellogg Library, University Hall, the Arts Building, the University Student Union and Science Hall 2. Great scenery. The holes on the upper campus are rather short, but the stiff breeze that is usually present provides a challenge. 1st tee is at the corner of Barham Dr. and Campus Way in San Marcos. Parking in the on-campus parking structure is $5 for 3 hours, or you can park in the Ralph’s grocery store parking lot and start on hole #8. Difficult to play before 2pm on weekdays – play after 2pm weekdays or anytime on the weekends (when campus is empty). Escondido Rotary Club DGC @ Kit Carson Park, Escondido, CA – This course is definitely one of San Diego County’s best! The 18-hole layout at Kit Carson provides a variety of holes: straight, left and right shots; big boomers and tight, technical shots; wide-open putts and baskets on the edge of trouble. Funds raised by the Escondido Rotary Club and the San Diego Aces made the course possible. Discs are available for purchase at the skate shop in the Escondido Sports Center, about a Destroyer-throw from the first tee. Rubber tee pads are now installed on all holes (Except #12, which has a concrete pad). Please be respectful of other park users – park gets busy with picnickers on the weekend. Goat Hill Park, Oceanside, CA – Goat Hill Park is home to the oldest ball golf course in San Diego County and now has a disc golf course that is available for play on Sundays. This is a loooong course – roughly 10,000 ft. – and can play longer in the afternoon when the breeze picks up. The course features lots of chances for booming drives, tricky pin placements near hills and drop-offs and plays along the trees that line the ball golf fairways. 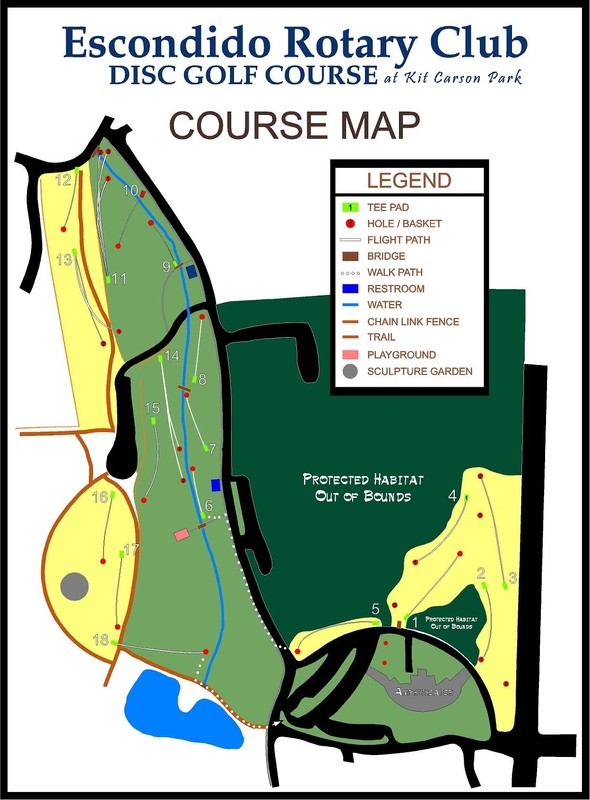 The layout for disc golf follows the ball golf layout – tees are near the ball golf tees or along cart paths. Fees: $10 for one round, $15 for all day play. The San Diego Aces hold a monthly tournament, alternating between singles play and doubles. Snacks and beverages are available at the pro shop. Olive Glen Disc Golf Course @ Sycuan Golf & Tennis Resort, El Cajon, CA – As you might guess from the name, this 9-hole course is set in the middle of a grove of olive trees. The course was installed Fall 2011 and hosted it’s first official tournament with its 2012 Ice Bowl. What the course lacks in length it makes up for with low ceilings that require precise shots. Fees: $5/day, monthly passes available for $30. Discs, snacks and beverages are available at the recreation center shop. San Diego Aces Disc Golf Course @ Brengle Terrace Park, Vista, CA – This 18-hole course opened in 2012. Built using baskets and tee pads donated by the San Diego Aces, this 18-hole course provides a variety of challenges, most notably elevation changes and some tight, technical low ceilings. Probably the best physical workout of any San Diego course. Discs, snacks and beverages are available at the pro shop near tee 17. Colina Park Golf Course, San Diego, CA – This pitch-and-putt golf course in City Heights added disc golf baskets in January, 2015 with some help from the San Diego Aces. Colina Park is home to a great organization: Pro Kids|The First Tee of San Diego, a nonprofit organization dedicated to helping underserved youth excel in life by promoting character development, life skills, and values through education and the game of golf. Since it is a youth group-centered facility, Colina Park has a strict no smoking and no alcohol policy and requests that players wear shoes and shirts at all times – please respect these rules! Most holes are under 300ft in length (so drivers are rarely needed) but the rolling terrain and tight placements of Discatchers next to bunkers and greens (both O.B.) add challenge to your round. This course is beautifully manicured – probably the prettiest place to play disc golf in San Diego County! $7/round weekdays, $8/round weekends, $10 play all day. Mast Park, Santee, CA – This free-to-play 9-hole course was installed as a cooperative effort between the San Diego Aces and the City of Santee, with the city purchasing the nine Discatcher baskets (plus a practice basket). The course winds through mature sycamore and cottonwood trees interspersed with newer pin oaks over mostly flat ground. Each hole has two tee pads (blue = long, red = short) and three basket positions, which will be rotated regularly by the Aces Course Rep. Jerry Jones. It is located in a back section of this multi-use park, far removed from picnickers and playgrounds. Congratulations and major props to you guys for doing all you do! I love seeing more and more awesome courses pop up. I would love to see dgc happen in fallbrook and bonsall area. I’ve noticed at least two ball golf courses had recently closed down. My current home course is kit carson and i love it but having one in my hometown would be awesome! De Anna Cove Park on Mission Bay next to ball golf course is eliminating the trailers and hopefully replacing it with open land. Has SD Aces had an opportunity to offer input? Thanks San Diego Aces for all the work you guys do!! Thanks for the offer Woody – we’ll be in touch when work parties are scheduled. We have had delays for several reasons, most having to do with contract negotiations with the City and the busy life of board members who are leading the effort. Just received a new version of the contract from the City – we’ll see how it looks. Hey friends! I am in town on business without a vehicle through Friday afternoon. I brought the discs I use most often in case there was an opportunity to get out and play. I am staying at the Holiday Inn Bayside just west of the Airport if anyone could pick me up and play. I got to play Morely twice last time I was in town, but would totally want to play it again if anyone can help me out. new to area! from the good ole charm city baltimore MD. any one i should first? Play them all! Each course has it’s own charms. Morley Field is a must-play because of its quality and history. Time to remove Goat Hill and Valley Center to this list. Coming out to San Diego from Oklahoma. Had one of our courses here destroyed by the tornado. Hope to have a couple good rounds out there! We need a desert course out here in Borrego springs! Agreed! Do you know of anyone who has access to land for a course? Is there another course near Escondido Kit Carson Park course? Someone describe where but i can recall the directions and am not familiar with it. Is the excellent 9-hole disc golf course off Cole Grade in Valley Center an Aces course or Kinetic or private (though open to the public) or … ? I recently played this course and thought it was a lot of fun and am surprised it’s not on this list. Great question! I’ve passed your request on to the folks in charge of the Brengle Terrace installation, T.J. Cruz and John Heaton. Once I hear back from them I’ll post it here. Word was the course would be finished late February, it’s now March 2nd, any progress??? The February date was a little premature, as there were insurance issues to iron out with the City of Vista. We’re ready to start construction now, and are asking for volunteers to help with the work. Aces Treasurer John Heaton is heading up the group, contact him at John@whirldsports.com if you’d like to help out. So what’s the word on Brengle Terrace Park in Vista. Me and my other SDA buddies can’t wait!!! We need a Kit Carson Park Disc Golf map; can you please provide? We’ve asked the course designer for a map and haven’t gotten a reply yet. We’ll keep trying. Will you be adding Goat Hill soon to this list, and when should we expect it up on the PDGA course list? Hi Dan – man, I forgot to reply to this! Goat Hill is now up on the PDGA directory, as well as those on dgcourserview.com and discgolfscene.com. I haven’t had a chance to add it to our Courses page on this web site, but will do that soon. Thanks for getting back to me! I want to know as soon as Brengle terrace has the insurance so I can help with the construction!!! Aces board meeting is Monday, Feb 13th. Should have more info after the meeting.